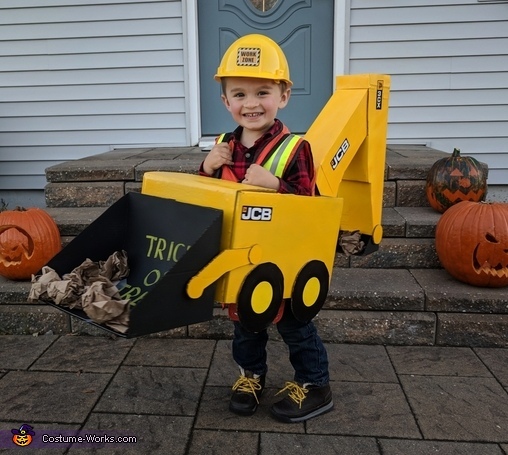 My entry is my 2.5 year old's costume, a backhoe. My son's name it Alex and he loves trucks. He has a speech disorder called Apraxia. This is a motor planning disorder where he understands everything but cannot say what he wants to say. He communicates with sign language, gestures, and word approximations that can only be understood by those close to him. One morning, we were watching cartoons and they were dressed up in costumes. I explained Halloween to him and asked him what he would like to be. His answer was "ba" for truck. I asked if he wanted a paw patrol or bob the builder costume. He shook his head no and again said "ba". I pulled up some pictures of trucks on my phone and he pointed to a backhoe. I was so proud of him for telling me what he wanted to be despite his challenges, I had to make it happen. I could not find a backhoe costume so I decided to make it. I used a cardboard box for the main chassis and another box for the front shovel. The shape of the back arm was cut from cardboard and i wrapped it in poster board to keep the weight down. Alex and I painted the individual pieces and glued them all together. Since he cannot say or approximate "Trick or Treat," I wrote it in the front shovel. Alex loved it so far but he kept trying to dig with it and saying "Ger" for dirt. I got some paperbags and crumbled them up and put them in the shovel. Now it was perfect. Alex was so happy wearing his Backhoe costume. He even learned a new word and called it a "hoho." Everyone we saw commented on how cool and original his costume was. It was all his idea, I just made it happen.